As always we bring you some inside peek of some unofficial devices. And this time around it is BlackBerry Curve Touch 9380 aka Orlando. The styling of the Curve 9380 is a mix of the BlackBerry Bold on the top of the handset, and it continues down into a design much like the BlackBerry Torch 9850. 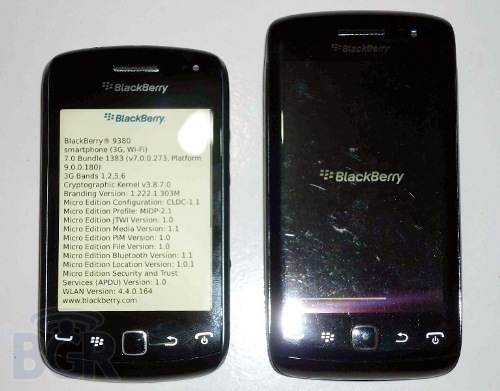 According to leaks the handset will come with a 3.25 inch touch screen, an 800MHz single-core processor under it with 1GB of RAM aboard, and the BlackBerry 7 OS running the show. The camera is of 5MP camera on back and can capture HD videos at 720p. The phone is also said to support NFC (Near Field Communication). The pricing is still unknown but we can expect this phone to land into the mid-budget section. So does the BlackBerry Curve 9380 impress you?